This story seems to be repeating itself quit frequently. If drivers knew they could face a prison sentence for assault with a deadly weapon, maybe they’d think twice about using their car to attack cyclists. A friend of mine had a driver chase after him with his SUV and when he went to get onto the pedestrian path, the driver DROVE UP THE PATH after him. Cops eventually came out and the driver claimed my friend had hit his car, damaging it. Which was false. The cops took the driver’s side and issued my friend a ticket for fleeing the scene. Rewind a bit; the driver DROVE up the pedestrian path to block my friend’s path. The safety zone for pedestrians in this city. 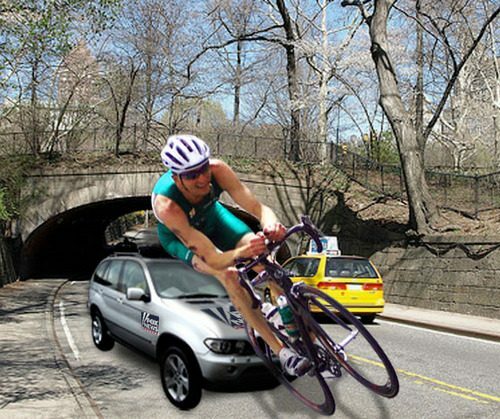 What should the NYPD do to drivers engaging in this behavior?